in one day. i know. if you want the post with content, read the previous one. this one is me catching up! first off – i go in to my first out-of-state show!! tiny canary in columbus, oh. hurrah! now to figure out the logistics of travel and whatnot. and the first write up of my book in a magazine has come out! i had no idea, until a kind blog reader sent me a little congrats note. then it took me several weeks to find a copy. i have to say, i remember looking through the last issue of this magazine and thinking how lovely it was. if you love wool, this magazine’s for you. 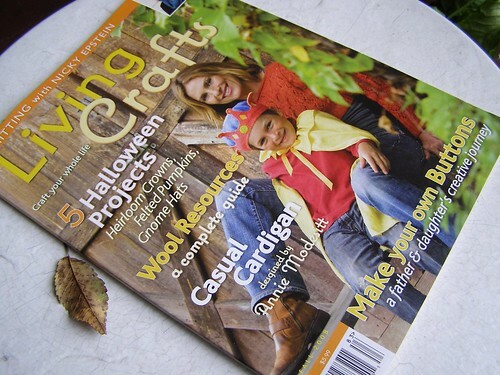 if you love wool and have a family, this magazine is doubly for you. i remember the other issue having this amazing wet felt play mat. 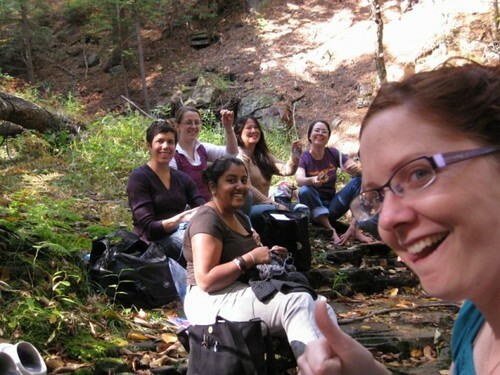 front to back: meghan, kai, dana, diane, maria, me… somehow we lost amy, who was also there. lastly, some pixie hoods have been popping up… here and here. and i love love love this hat. i adore when the projects made from my patterns are something i would never make. claim that pattern and make it your own, i say! there’s so much happening, you’d think the season’s were changing or something :D tonight’s dinner? fresh tomato soup. more tomorrow. This entry was posted in book, community, cosyknitsliterally, patterns, spinning by cosymakes. Bookmark the permalink. I’ve never heard of that magazine! Something new to check out. Awesome.